Old World elegance is displayed in fresh colors for today. 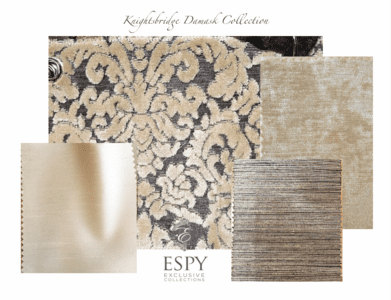 Enjoy sumptuous cream colored velvet against the steel grey background in a high/ low damask pattern. Both the cream and the grey colors shift in hue and brightness as they are illuminated from various angles. Email Design Nashville for quotes on custom designs made of these materials while supplies last.